07:30 and Nigel, Arthur Jenkins and Steve Hyman arrive at Hopetown. Fire lit, kettle boiled, then down to the business of the day. Rails joined, connected and, oh dear, much snow to be cleared from the rails and the loading point before the rail trolleys with components are pushed out. Nicky and Daryl arrive with the hiab shortly after 08:00. 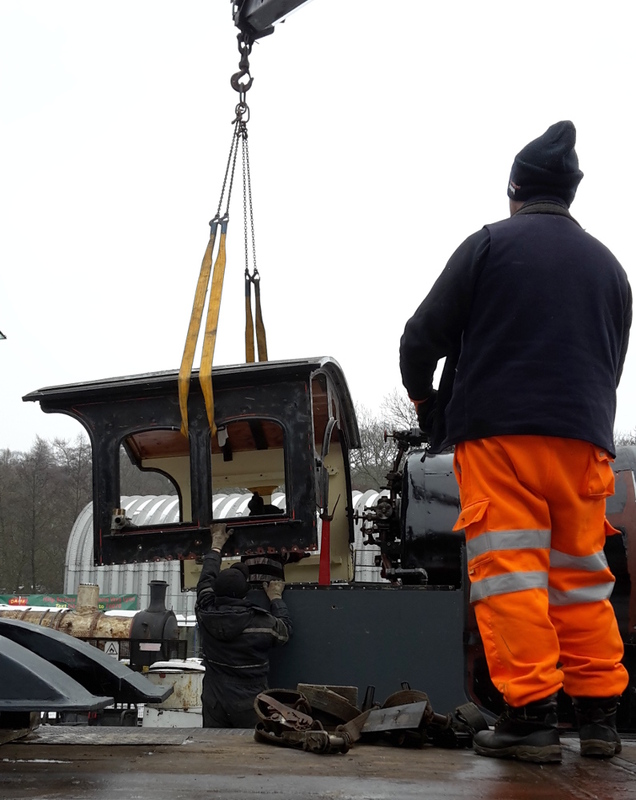 Cab, chimney and sand boxes loaded on board whilst Steve and Arthur lift the 4 springs with the frame onto the last trolley. By 09:00 everything is on board and being strapped down. Tea is being made when a cry of anguish comes from the mess room - no sugar, two require it for their tea. Fortunately the corner shop is now open and matter soon resolved. By 10:00 Nicky and Daryl have left for Grosmont and the rest tidy up and sign out. The last bits of the J27 have now left Hopetown. Approaching Scaling Dam, Nigel catches sight of a familiar cab on the back of a hiab up ahead. Cars overtake the hiab, and the van is eventually on its tail. After we make the right turn for Egton, Nicky signals to come through and guide. The snow situation is much easier today – the only uncleared road is along the old track from Esk Valley to the shed. We arrive before noon to find a silent MPD, but very active working party inside Deviation Shed. The new arrivals accept the offer of tea and biscuits, before the working party goes for its lunch. Mark O'Brien opens up the door to No 2 road, but the shunter he brings from No 5 road has great difficulty moving back up the yard. Out with the shovels to clear ice from the rails and try again. Success. The J27 is dragged out of the fab shop and the cab lifted straight on from the hiab (see photo). Springs, sand boxes and chimney unloaded and by 13:30 the hiab was on its way home. Trevor and Ian help to unload the Q6 piston valves.